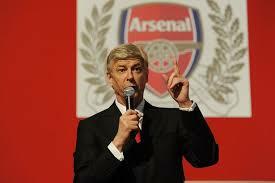 Arsene Wenger, manager of Arsenal has congratulated Nigeria on their 2018 FIFA World Cup qualification. The Super Eagles of Nigeria secured a World Cup ticket with a 1-0 win over Zambia on Saturday, October 7. It was Arsenal star Alex Iwobi who scored the goal that sent the Super Eagles of Nigeria to their sixth FIFA World Cup and Wenger is even prouder of his player’s achievement. “Congratulations to all the fans in Nigeria, I know that you are very very many and we are very proud that you qualified,” Wenger said in a video released by Arsenal. “On top of that, of course, our player scored the goal for you that makes us very proud. Nigerians are very fond of Wenger especially because of his relationship with national hero Kanu Nwankwo whom he managed at Arsenal for six years. Before Kanu, Wenger had worked with Victor Ikpeba, signing the then youngster from RFC Liégeois in France. The Veteran French manager manages Iwobi along with Chuba Akpom, a Nigerian-born youngster.